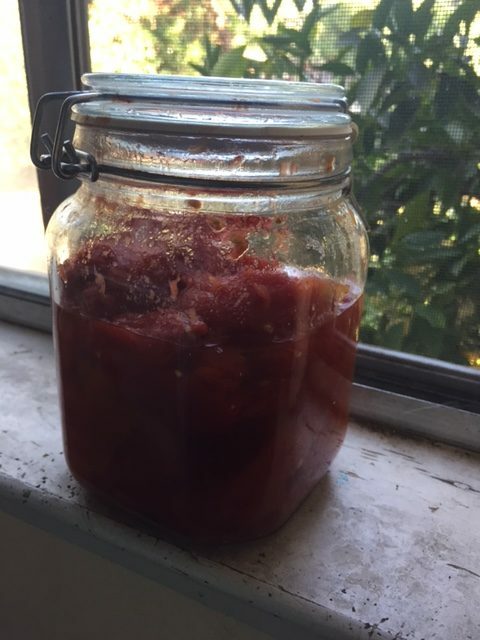 One of the most fun things to do when you’re overrun with plum and Roma tomatoes is to make your own marinara from scratch! It’s easier than it sounds, and the results are far healthier. You can also buy a load of tomatoes from your CSA or a farmer’s market if you have that as an option. I love growing tomato plants. I use GrowBoxes. Self-watering containers are great. During the heat of the summer, I probably have to water every other day. This year, I didn’t get as good of a crop as prior years. I still grew a bunch of different Roma varieties including San Marzano. They tend to be sweeter than most and are perfect for making a tomato sauce. And of course, they aren’t always ripe at the same time. So I’ll pick what I can, and then process them a little bit, and I’m storing them in a jar in my fridge. 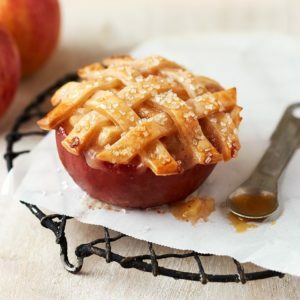 You could also do this with a steamer, in the microwave, or using a special steaming pot on the stove. You will want to have some way of separating the tomato from the water. I use a simple metal vegetable steamer insert. You can find plastic ones that will work for the microwave. You can also use the steamer insert right in a pot on the stove. Put in some water, insert the steamer and then go prep the tomatoes. I cut out the top core of the tomato but leave the rest alone. Steaming will make it easier to get the skins off. And I like to pre-stew the tomatoes a bit. This is a bit of a personal thing, honestly. You’ll need to play with a few tomatoes to get the hang of it. I like to use the steam function for 0 minutes. Then I do a quick release and try to get the tomatoes to cool down quickly. Finally I’ll peel off the skin and toss the tomato into a jar. Not a problem. The reason why I want you to make your own marinara from scratch is because it’s healthier and so much better tasting. You won’t get all the sugar that the jarred sauces have. Buy some good canned whole peeled tomatoes. I personally find Hunts to be the best quality. You may want to choose organic. My mom always used S+W. One big bonus with canned tomatoes is you can get them seasoned. Some are made with basil so the flavor gets infused. Your tomatoes are prepped. So let’s get to work. First, look in the mirror. Are you the kind of person who likes fresher tasting marinara or the kind that likes the slow cooked earthier flavored marinara? And what do you want to serve it with? I make marinara from scratch using canned tomatoes for my holiday manicotti. I’ll put in the recipe here some day but it’s not going to make you thin eating it, believe me. Also, you want to think about if you’re going to serve it as is or if you’re going to add in meat with it like Italian sausage or ground beef or turkey. I think the fresher marinara is better with zoodles and angel hair pasta. You can also use it for dipping sauce for breadsticks. And I think the slower cooked marinara is better with baked pastas, meat added (aka bolognase), or the thicker spaghetti. I recommend Craftsy’s Classic Italian Pasta Sauces: Meat & Tomato with Giuliano Hazan class. I learned oodles and think you will too. I’m always watching Craftsy classes when cooking and getting ideas for next week’s meals. Let me know if you enjoyed this style of blog post. Leave a comment below or contact me.